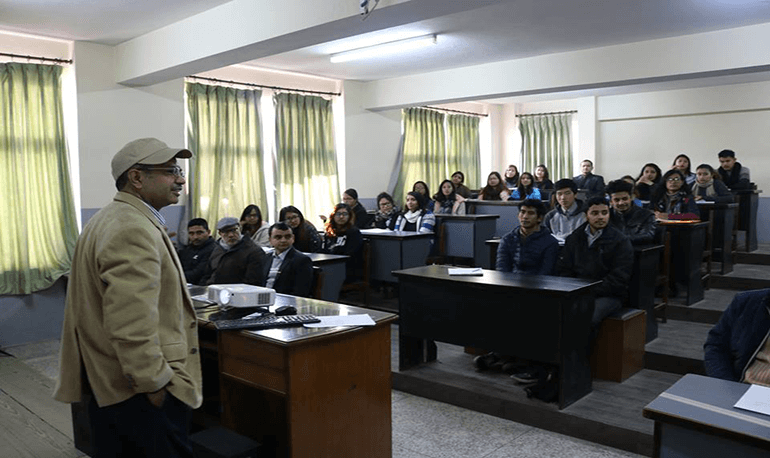 A seminar on ‘Bond Market in Nepal and Currency Risk’ was conducted on 23rd december,2016 which was for the 3rd year Finance and Banking group to get an insight about the current scenario of bond markets in Nepal. Dr. Manoj Shahi, CFA was the first speaker who highlighted the impact of bond market in a developing country like ours, talking its history, current scenario and the future aspects. As one of the popular debt instruments in the developed nations, he mentioned how bonds play a very important role in developing diversified investment environment which can act as a cushion against risk from the concentration in the bank loans and equity market. Similarly, the second session was forwarded to Mr. Hemanta Bashyal, CFA, and FRM, who discussed on the various currency risks to the national economy including the recent demonetization in India. He also drew some light on how the investors or companies that have business operations across national borders are exposed to currency risk that may create unpredictable profit and loses. The major topic discussed here was the currency risk to the economy.